An insightful, urgent, and perennially relevant handbook that lays out in common sense language how the United States Constitution works, and how its protections are eroding before our eyes—essential reading for anyone who wants to understand and parse the constantly breaking news about the backbone of American government. The Constitution is the most significant document in America. But do you fully understand what this valuable document means to you? 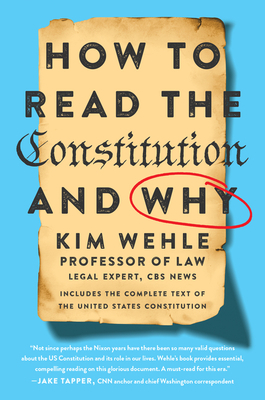 In How to Read the Constitution--and Why, legal expert and educator Kimberly Wehle spells out in clear, simple, and common sense terms what is in the Constitution, and most importantly, what it means. In compelling terms and including text from the United States Constitution, she describes how the Constitution’s protections are eroding—not only in express terms but by virtue of the many legal and social norms that no longer shore up its legitimacy—and why every American needs to heed to this “red flag” moment in our democracy. This invaluable—and timely—resource includes the Constitution in its entirety and covers nearly every significant aspect of the text, from the powers of the President and how the three branches of government are designed to hold each other accountable, to what it means to have individual rights—including free speech, the right to bear arms, the right to be free from unreasonable searches and seizures, and the right to an abortion. Finally, the book explains why it has never been more important than now for all Americans to know how our Constitution works—and why, if we don’t step in to protect it now, we could lose its protections forever. How to Read the Constitution--and Why is essential reading for anyone who cares about maintaining an accountable government and the individual freedoms that the Constitution enshrines for everyone in America—regardless of political party. Kim Wehle is a tenured Professor of Law at the University of Baltimore School of Law, where she teaches and writes on the constitutional separation of powers, administrative law, and civil procedure. She was formerly an Assistant United States Attorney and an Associate Counsel in the Whitewater Investigation. Professor Wehle is also an On-Air and Off-Air Legal Expert, Analyst and Commentator for CBS News, as well as a Contributor for BBC World News and BBC World News America on PBS, an Op-Ed Contributor for The Bulwark, and an Opinion Contributor for The Hill. She has been a regular guest legal analyst on various media outlets regarding Special Counsel Robert Mueller's probe into Russian influence in the 2016 presidential election and other issues regarding the structural Constitution and the Trump Administration, including on CNN, MSNBC, NPR’s Morning Edition, PBS NewsHour, and Fox News. Her articles have also appeared in the Baltimore Sun, the L.A. Times, and NBC News Think. She is regularly interviewed and cited by prominent print journalists on a range of legal issues. She lives in Chevy Chase, Maryland, with her children.